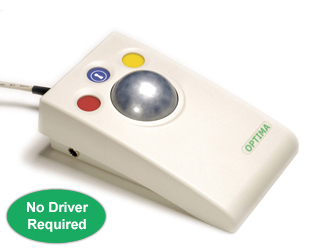 Optima Joystick and Trackball are compact, desktop mouse alternatives that do not require fine motor skills and are suitable for a wide spectrum of computer users. They are specifically designed to respond to the lightest touch to give accurate cursor navigation and precise targeting of objects on the computer screen while occupying the minimum amount of desk space. 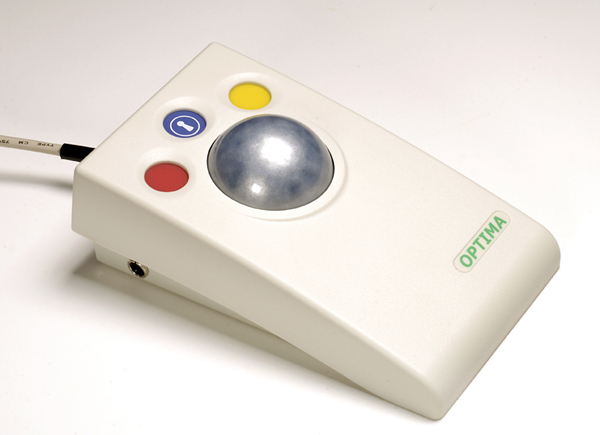 Optima also features a low profile, providing a natural hand rest for comfortable operation, and will work with USB and PS/2 compatible computers of all types. As with all of Pretorian’s mouse alternatives, no drivers need be loaded onto the computer. There are four speed settings and the centre button gives the user access to a ‘drag’ feature, allowing the left click to be engaged for an extended period, for example when moving an icon on screen. Additionally, the unit is switch adapted via two 3.5mm sockets, giving the same switch functions as the red and yellow buttons.